What could be more satisfying than old world craft married to modern lines? 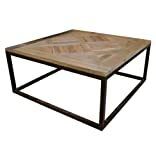 This reclaimed parquet surfaced table is a great example of how this fusion can work so well. We could see this piece in a Paris living room, mixing with antiques and deco modern styles with ease. So versatile, there's hardly an style that this wouldn't compliment!